Dubai City in United Arab Emirates is one of the leading business hub and global metropolis in the world. It was Dubai’s financial, real estate and tourism sectors, which had enabled it to achieve this high status. Due to these reasons, people from all around the world come to Dubai and therefore you will find almost all types of restaurants and cuisines in this city. Chinese is one of the most popular types of cuisines that one can easily find in Dubai, as it is served in the numerous Chinese restaurants of the metropolitan. If you are a Chinese food lover and want to learn about different Chinese restaurants in Dubai, then consult this listing for more details. Al Raffa Street in the area of Bur Dubai has several food vendors which attract lot of tourists and locals, who come here for work or shopping. One such food stop at this street is Bamboo Garden Restaurant that serves inspiring Chinese cuisine. The taste and quality of the food served at this bistro is great. In addition to this, prices of the dishes are reasonable and guests have plenty of space in this eatery to dine in. Ramda Hotel in Bur Dubai is another hot spot for Chinese foodies, as Dynasty Restaurant within this venue serves one of the best Chinese dishes in the town. The variety of dishes is quite extensive in this eatery and guests can relish these items in their private dining area as well, but it requires advance booking. Chinese, Arabic, Middle Eastern and Indian cuisines are the specialties of Foodworld Restaurant in Bur Dubai. This wonderful restaurant not only has an extensive and delicious menu, but its interior decor and atmosphere is also quite alluring. Due to these fine features Foodwrold Restaurant attracts people from all over Dubai. Deira City Centre in Dubai has a wonderful Chinese restaurant in it, where guests can savour varieties of Far East region. This fabulous bistro is known as China Times Restaurant and it serves numerous specialities of Chinese affair for instance dim sum, crabs, corn broth, vegetarian dishes and lot more in a excellent environment. Marco Polo Hotel in Dubai has an excellent Chinese restaurant in it, which is called Chopstix that is well-known for producing rich and delicious Chinese dishes. It menu boosts a lot of Chinese varieties, which guests can relish with range of alcoholic beverages. Its oriental style and pleasant atmosphere are ideal to savour Chinese food. If you are looking to give a treat to your taste buds, then head towards Ding Xiu Suan Restaurant at Al Khaleej Palace Hotel in Dubai, as it is famous for producing mouth-watering Chinese fare. 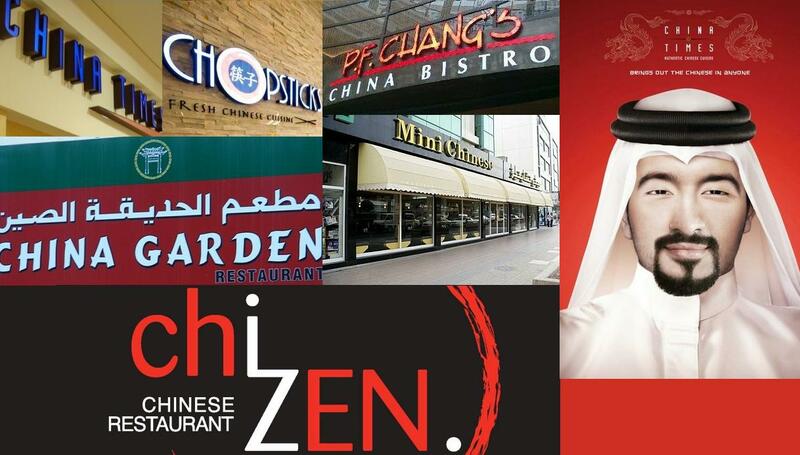 Due to the authenticity and high quality of the food offered at this bistro majority of the Chinese community in Dubai prefer to dine-in at this venue. Arabic, continental, Chinese and Indian cuisines are the specialities of Shamiana Restaurant at Landmark Plaza Hotel in Deira, Dubai. This superb restaurant has made its mark by producing high quality and tasty food of different regions of the world. As a result of that Shamiana Restaurant is a favourite among all communities residing in Dubai. Caesars Restaurants & Confectionery is an international chain of restaurants and confectioneries. This group also has an outlet in Dubai, where they dish up all their delicacies, which includes Persian, Indian, Middle Eastern, Chinese and other sizzlers. People of Dubai can also avail their catering services to savour their delicious food at their private events. This fine restaurant serves authentic Chinese food, which guests can relish with wide assortment of drinks available at its fully licensed bar. The menu of this restaurant is varied, as it comprises of dishes from different regions of China, including Cantonese. Aside from food and drinks, guests can also take pleasure from the panoramic views of the city from its open terrace seating. If you are looking to relish Asian, Japanese, Malaysian, Chinese and Fusion affair from one site in Dubai, then Chop Chop Restaurant is an ideal destination to head towards. This wonderful restaurant not only has a varied menu, but the quality and the taste of the food is great too. Their specialities include famous dim sum and pecking duck dishes as well. This restaurant can be found on the second level of The Dubai Mall, where it quickly serves authentic Chinese food to its customers. The menu of this popular Chinese bistro boosts famous varieties like crabs, lobsters plus some signature dishes of the chefs, which guests can also enjoy at its open seating area as well. Hukama Restaurant has a wide menu that comprises of various Chinese delicacies. In addition to this guests can also order a variety of tea-based cocktails and mocktails at this eating place that has a bar as well. People of Dubai can relish all these things in the elegantly and sophisticatedly designed interior of the Hukama Restaurant that is located on the sixth floor of The Address, Dubai Mall in the region of Downtown Dubai. Ping Pong Restaurant is another highly regarded Chinese restaurant in The Dubai Mall of Downtown Dubai that has earned a decent repute, when it comes to serving traditional and authentic Chinese cuisine in a contemporary way. All dishes at this venue are prepared by hand and include freshest and finest ingredients to produce dishes with rich flavours. Famous dim sum menu can also be ordered at this restaurant aside from other regular food stuff. Chinese culinary is one of the most famous cuisines to consume in Dubai, as a result of that Dubai Media City also got some Chinese bistros within it that serves authentic and mouth-watering Far East fare. Mah Jong Restaurant is such site in Dubai Media City that serves traditional Chinese dishes that are high in quality and great in taste. The speciality of this eatery is crispy duck that is tender and full of flavours. In addition to this, guests will also find varieties like shu mai dumplings, sesame ball, desserts and a lot more. Royal Kebab Restaurant on the other hand is a venue, where people of Dubai will get the best of both Indian and Chinese fare. As, the menu boosts delicacies like traditional biryani, curries, kebabs, tandoori items and various Chinese dishes. Guests can take pleasure in all these dishes, while watching sports on big screens or using the free Wi-Fi service installed at this restaurant. In addition to this, sheeshas are also available to the guests, whole like to smoke different flavours of it. In brief, Royal Kebab Restaurant has got almost everything that one can expect from this type of eating place. This Chinese restaurant is located in the famous area of Jumeirah in Dubai, UAE, where it welcomes guests to savour traditional Chinese dishes in a pleasant atmosphere. The menu of this eating place is varied as it includes appetizers, soups, poultry, meat items along with seafood dishes and much more varieties. All these dishes are prepared from the freshest ingredients in order to produce high quality foodstuff. Guests can also avail the takeaway service offered at this restaurant to enjoy its scrumptious meal at home or any other place. Smiling BKK Restaurant is an eatery that serves not only authentic Chinese dishes, but Thai and Asian cuisines as well along with some vegetable varieties. Due to these features Smiling BKK Restaurant has big menu as compared to any other Chinese bistro. People of Dubai can find this tiny eating place in Al Wasl Plaza that is located near Al Wasl Road. From this location Smiling BKK Restaurant offers a wide range of services to its guests, aside from the delicious and quality food. Due to this reason, Smiling BKK Restaurant is quite famous among the locals, who kept this place bustling most of the times. This restaurant provides people of Dubai a wonderful experience of consuming both Chinese and Sri Lankan cuisines in the district of Karama. As this bistro not only offers a la carte menu dishes at affordable rates, but also buffet deals on reasonable prices during lunch and dinner hours. Due to this reason, several Asian food lovers turn up at this venue to relish the culinary of Far East region without digging deep inside their pockets. Delhi Darbar Restaurant, although seems a typical Indian bistro, also provides a fine range of Chinese dishes as well. This restaurant has earned a decent repute by producing unblemished vegetarian, Indian and Chinese fare. People of Dubai can also relish the delicious food of this restaurant in the private dining area of Delhi Darbar if they want some privacy. Mak’s Food Restaurant is not much different from Delhi Darbar Restaurant, as it also dishes up both Indian and Chinese fare. However, the number of Indian dishes at this venue is limited, but guests will find a lot of variety in Chinese food since the menu includes all famous delicacies of China such as soups, noodles, poultry, seafood, beef and much more.